...co-created by the artist who would co-create Ant-Man! Using the classic idea (first embodied in comics by the original Captain Marvel) of a kid magically-transforming into a super-powered adult, Joe Simon and Jack Kirby devised a new insect-themed character for Archie Comics' first attempt at a super-hero line since they cancelled the last of their costumed characters in the late 1940s to concentrate on books about Archie and his entourage. Among the Fly's attributes were flight, super-strength, enhanced eyesight, and the ability to cling to walls and ceilings. Oddly, the talent to grow and shrink was not one of his initial powers, though it was added later on. The Simon & Kirby comics studio "packaged" Adventures of The Fly and Double Life of Private Strong: the Shield for Archie, with Simon, Kirby, Bob Powell, George Tuska, and Jack Davis, among others, providing scripts and artwork. This never-reprinted Joe Simon-written and illustrated tale from Archie Adventure Comics' The Fly #3 (1959) recaps the basics of his origin story without the various fights and chases that filled out the page count of the first issue. Now you may notice that the character is called "The Fly", not "Fly-Man"! 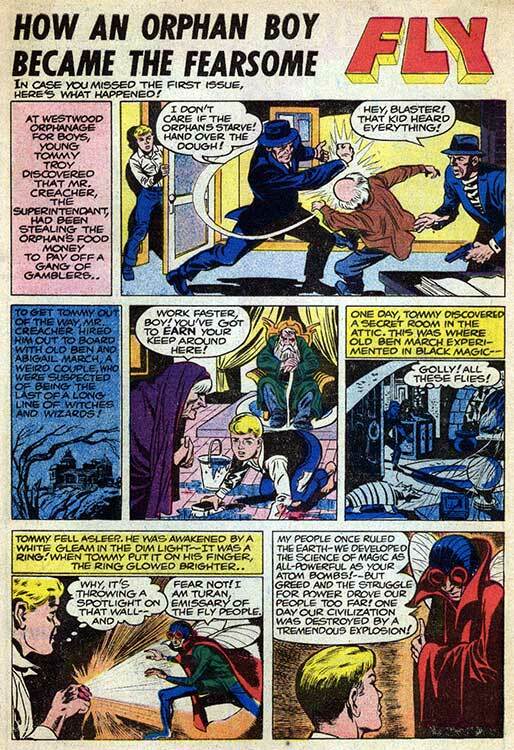 After four issues, Simon and Kirby ended their long collaboration and went their separate ways. The book was brought "in-house", and now produced by Archie's editorial staff. 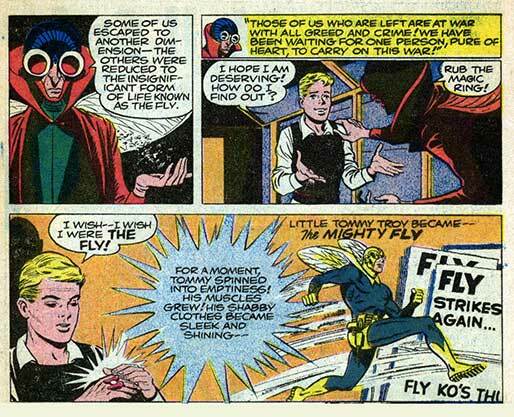 The storyline was "rebooted" by making the teenage Tommy Troy into the adult Thomas Troy and stating he hadn't used the ring to become The Fly in nine years, re-setting the earlier issues (which featured 1959-contemporary clothes and technology) around 1950-51! Other superheroes, including Private Strong: the Shield and the Golden Age Black Hood begin popping in for guest appearances. A new girlfriend, Kim Brand, gains her own magic ring and becomes Fly Girl. However, despite these changes, the book is cancelled in January, 1964 as of #29. The Fly and Fly Girl's strip moves to the backs of Pep Comics and Laugh Comics before their title is revived with #30 in October 1964, then retitled Fly-Man with the next issue, which came out in May, 1965. (Yes, that's over half a year between issues! Why that happened and what resulted will be shown tomorrow...with the warning that what you'll see may shock you!